My job as a technology integration specialist for a PreK-12 public school district became a whole lot more interesting this year as the schools I support implemented a 1-to-1 iPad program in grades K-12. It’s been especially exciting to see the creative things the teachers and students are doing in the arts. Arts teachers Vicki Angell and Elysia McGill have their vocal students record themselves singing. The immediate feedback kids get by listening to themselves leads to greater improvement. Angell, who teaches at Sabetha Middle and High Schools, has her students record close to their own mouths while singing parts in a group since she feels that is a true measure of what they do in a choral group. The iPhone has a nice built-in recorder as part of the operating system, but on the iPad you’ll need to download an app. Voice Record Pro is a free option. Angell also records groups singing with accompaniment and sends the sound file to the students to use for practice outside of class. 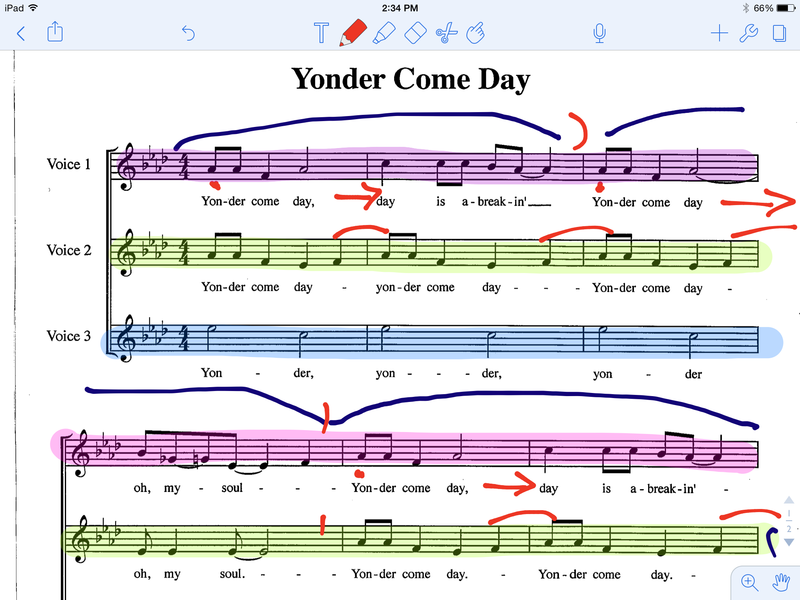 She also uses the annotation options in Notability to have students highlight and mark up PDF versions of the music they are working on. Students then highlight their parts with a color of their choosing and mark entrances and phrases in blue with a red dot over syllables that should be emphasized. Angell also uses GarageBand in the high school open choir to teach 12-bar blues and have students play the accompaniment (guitar chords) to simple 4-chord songs as they sing. It enables them to see and experience chord progressions and the harmonic structure of a song. The most valuable use of technology, she said, has come from individual singing tests. “I have used personal recording of their part to be submitted to me for singing tests, but the best and most authentic test for me is how they sing in a group. I use this in my top choir only, at this time, and students use their own devices to record themselves and then email or text it to me. In her visual art classes, Connie Herbster’s students at Sabetha High School use the iPad’s camera to take original photos or save photos found online to manipulate and create original art. She keeps a poster in her room for students to add suggestions for art-related apps, games, and resources that they find. Sara Hasenkamp creates instruction videos of art techniques for her students to view. These come in handy especially when she has a sub. Hasenkamp’s fifth-graders made word art (sometimes called subway art) using the Pages app. “I wanted them to see that technology can be a tool to create art -- not just as a word processor, game system, or research tool. I airdropped a template to them and they changed words, colors, fonts, shapes, borders, background, and organization to make something of their own. The kids had fun and each one had something worthy of our spring Art Show,” she said. The logistics of iPad use is unique in art classes without traditional seating or where students are expected to stand, work with potential messy materials, or play an instrument. 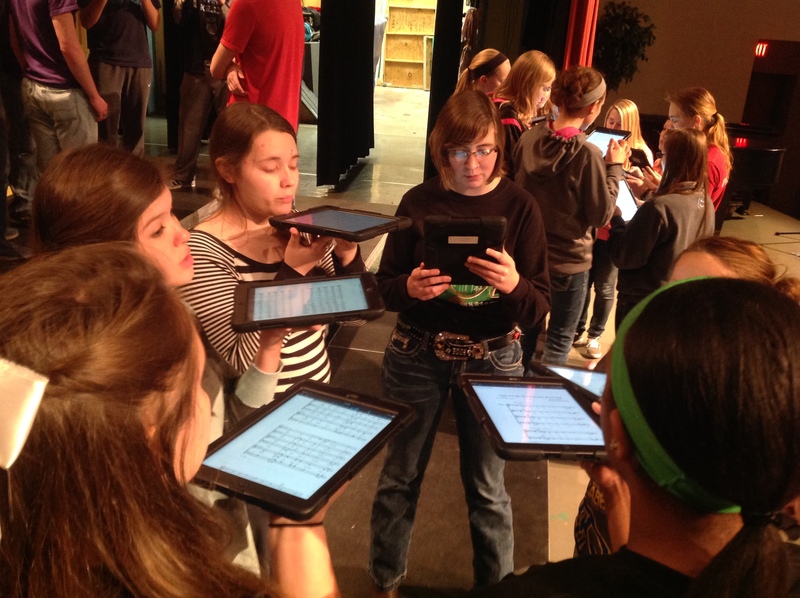 “I had to figure out where to put the iPads when we weren’t using them, which is about 80% of the time,” Scanlan said. “I found a shelf, put numbered magazine boxes on it, and assigned each student in each of my classes a number. That way when we weren’t using iPads, they wouldn’t be on the floor, in students’ laps, on music stands, or in an otherwise hazardous or distracting place. I wanted to be able to totally separate the students from iPads." Photo: "Music: an art for itself" by Steve Mueller. Used under a CC BY 2.0 license.